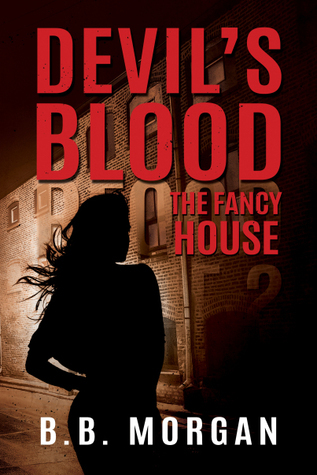 Book 3 in the Devil’s Blood series. On the upper east city of Belle City, the Fancy house sits empty. Locals claim it’s haunted. When a call takes Malone inside the house, she finds the ghost of a dead girl, and something else – something much worse. While sorting through the mysteries of the Fancy house, Malone is tasked with finding Sylvester, by infiltrating the thieves’ guild under a false identity. Ghosts, thieves, and sounds underneath old floorboards – one wrong step, and it’s over. Alice Malone disliked Belle City’s lack of stars. The radiant light from the numerous streetlamps across the city glared into the sky and blanketed the underside of the clouds with a ghostly dome of orange. All the stars in the sky seemed a hefty price to pay for the city’s conveniences, but she paid it. Outside the city, millions of stars littered the sky. One day, she’d like to see them again, but until then, the stars would have to wait. She had business in Belle City. Malone crouched along the darkened alley that stretched between Jefferson Drive and Mason Avenue, two prominent old streets with prominent old homes. The streetlamps on either side of the alley didn’t reach far enough in to expose her. Her silent, shadow-colored clothes hid her from any late-night passerby. She’d spent two weeks on the lookout, memorizing the cars, the people, and the routines along Mason Avenue. Then she did what any decent thief would do: she picked the easiest target. On this side of Belle City, the old-money people lived in their inherited luxury and had plenty to spare. It wasn’t like she was taking a piece of bread out of a starving child’s hands. In the house she’d chosen to burgle lived an elderly woman who wore pearls to the grocery store. She went every Tuesday afternoon, chauffeured by car service. The service didn’t stamp their name and logo on the side of their shined black cars, which meant they were pricey and private. The name on the mailbox read Catter. Malone assumed the woman of the same Catter family who owned one of the largest banks in the city. Malone had never held a bank account, but she’d heard plenty about Belle City First Bank. When Malone had joined the thieves’ guild, about eleven years ago, one of the bankers at the Belle City First Bank had hired the thieves’ guild to steal gold from an up and coming competitor, which then put the competitor out of business. The Catter family had done enough back-alley deals with the guild that they deserved to be robbed. Malone crept along the alley to the narrow alley that ran between the backyards of Mason Avenue and Jefferson Drive. Each home had its own square of grass, bordered by a dark green fence; the fence came to nose-height, just right for the average woman to peek over the top. Malone had watched plenty of the women do so. She hated nosy people. She came to the fence that bordered Mrs. Catter’s petite backyard. She boosted herself over the fence and into the dark backyard without much more than the ploosh her feet made when they hit the ground. Malone stayed in her crouch; she waited for any sign that someone had heard her, like a creak of a window sill, the swish of a curtain, or the glint of a flashlight moving about the darkness. When she felt satisfied that no one had heard her, she started to creep alongside the fence. Like most up-town people with tiny backyards and little room for yard-care devices, Mrs. Catter had placed fake-grass over her concrete yard. Unlike real grass that would have faded and crisped this time of autumn, the fake-grass muffled Malone’s steps like soft, ripe grass would. Malone crept toward the side of the house where a basement window set into the stone. She knelt by the window and pushed on the seam. Locked. Through the foggy glass, she could see the old-fashioned, simple lock. It had turned rickety with age and a bit rusty; with luck the spring had rusted, too. The window’s lock, like much on the upper east side of Belle City, had come from a bygone age when security didn’t extend to windows. Malone flattened herself on the fake grass and pushed her shoulder into the crux of the window frame. She wiggled and worked and pushed until the rust on the locking mechanism gave out and the latch snapped like a fat twig. She paused; she heard no cautious footsteps tiptoeing, or the creak of an upstairs window opening. She wiggled her gloved fingers under the wooden pane and slowly eased it up. The old-fashioned window angled instead of sliding, and Malone swiveled the window only as far as she needed to. She then slid underneath it and dropped into the dark basement. Her soft-soled boots padded on the hard, dusty floor and sent little rotten-smelling puffs into the air. She hesitated by the window for sounds; she could still escape if she needed to. She heard no soft murmurs of alarm, or the squeaks of someone getting out of bed. The old woman lived alone. She’d make plenty of sound if she started to move. Malone eased the window back into place, but left it ajar. This part of the job thrilled her. She loved it. Regardless of a thief’s skill or experience, the random chance stood firm. Mrs. Catter might wake from a dream, or to visit the ladies’ room, or for a glass of water. Someone driving by might see a shadow move in a window, or another thief might enter the house. Both had happened to her before, and she never threw out of the possibility. The thrill of the heist sizzled through her bones. It was an enchantment, a high, and she had missed it. Keeping the law felt good, but breaking it gave her a sense of thrill that nothing else could. Malone crept through the musty basement that looked to be used mostly for storage. Boxes were piled floor to ceiling against every wall, some three deep. One box had been recently opened. A set of dishes had been arranged on neighboring boxes, a fine china set with autumnal leaves hand-painted on each teacup, serving platter, and plate, bowl, and spoon handle. Curious, Malone tipped one of the teacups over. She couldn’t read the name on the bottom, but she didn’t have to. She recognized the spiraling leaf logo. Mortimer. The entire set would cost upwards of five hundred gold. She set the teacup down. It would be impossible to get the entire set out, and this wasn’t about the gold. The floor above creaked; Malone froze. She held her breath. She quickly took account of the quickest path to the window. She could be gone before anyone made it to the bottom of the stairs. When no following sound came, Malone willed her devil’s blood to burn; it coursed through her veins like fire, sharpened her senses, and filled her with the familiar ethereal lightness, as if she were made of air. Shadows lightened. Odors of pungent mold, mice droppings, and bleach purged her sense of smell. The scratchy feet of mice scurried elsewhere in the basement. She focused her hearing on the upstairs. The house settled around her with the barely silent creaks and groans of an old house whose nails had begun to rust and whose boards had shrunk and expanded with a hundred years of seasons. Mrs. Catter let out small snores as she slept. There was no one else in the house. Malone let her blood’s burn fade, but not completely. Though she hadn’t planned on using her blood on the job, a little extra luck never hurt. Especially thieves. Malone had devil’s blood, making her a devil. According to the PAB, that meant she had spiritum in her blood. She crept through the basement and found stairs leading to the first floor. She took each step with severe caution. Creaky steps had led to the demise of many thieves. She made it to the top without incident and eased through the first floor of the well-kept old house. Everything looked dainty, like a tea party, with lace doylies underneath every lamp and draped across every table. A collection of teapots with matching cups lined one glass-faced cabinet and big-eyed dolls lined another. Malone kept away from the windows. She didn’t want some nosy neighbor suffering from a bout of insomnia to see anything strange and call the PAB with their vindictive attitude of goodwill and peace. Malone slid along the shadows on the second floor. She crept lightly; loose floorboards were just as bad as creaky stairs. Most homeowners knew each creak their house, and when that loose floorboard downstairs creaked without them stepping on it, they had to find out who had. The master bedroom took up the same amount of space as Malone’s entire apartment. The bed itself was as large as her entire bedroom, and the extravagant size made the old woman sleeping on it even smaller than she was. Yellow and red curtains draped the four-poster bed and had been pulled partially closed on all but three sides. Bedcurtains. Who the hell had bedcurtains? Malone crept to the walk-in closet through adjoining pocket doors. One small window near the ceiling let in the pale orange streetlight. The south wall of the closet had been dedicated entirely to shoes: pointy-toed heels, fashion boots, and five pairs of different colored house slippers. The north wall held an array of hats, scarves, and cardigans enough for fifty women. On the east wall, below the window, several angled wooden racks were devoted to jewelry. Malone slid along the polished wooden floor like a shadow and lifted a golden chain of diamonds from its resting place. With a flick of her wrist, it vanished into her pocket. She lifted another that looked like emeralds and it, too, vanished without a sound. She thought about lifting something else, but she hesitated. New thieves often fell to their greed. They took what they could carry, stuffing their pockets, and then woke their victims with all the clinking and clacking. With the same ghostly footsteps, Malone retreated from the closet and left the house the same way that she’d come. Back outside, she pushed her blood to burn. The escape had fouled many heists, too. She heard nothing of nosy neighbors or neighborhood hoodlums. Night bugs buzzed. Rats scurried. cars a few streets away rumbled along the road. She pushed the window closed and hopped the fence into the alley. She waited for a car to pass and then ran into the next alley. She zigzagged through Belle City’s numerous alleyways, heading southwest. She loved the feeling her blood gave her. It felt like if she ran fast enough and jumped, she might be able to fly. Once she left the uppity rich district behind, she paused in a dark alley to catch her breath. She let her blood cool; if she kept it burning for too long, her body would begin to ache. The autumnal night air chilled through her jacket. She should have worn an extra layer for warmth, but she hadn’t wanted the extra weight. Malone walked the rest of the way to the intersection of Roston and Townsly, when a great gong sounded: the bell of Belle City. It chimed the hour at six, noon, and again at six with three long gongs. By the time she reached the corner of Perkins Street, the east glowed warm butter-gold and easy purple. Malone relaxed into a causal saunter and headed down Perkins toward Mary’s Gems and Jewels. The owner, Paulson, like many of Belle City’s fences, had early morning hours to accommodate costumers with hot property. She hesitated a few shops down and checked the time on her red PAB communicator. Fifteen past six. Show time. She pushed open the frosted glass door to Paulson’s shop. A bell above the door announced her arrival. Paulson, a beady-eyed man of average height and weight, stood at the counter, arranging a ruby display on a white cushion. If Paulson saw through her disguise, he played ignorant well. Malone had graced his shop several times in the past few weeks with stolen jewelry, most of which had come from the PAB’s evidence room. She had started to worry the guild might suspect something amiss with a sudden rush of stolen jewelry without worried owners looking for it or claiming to have been robbed. If she wanted to get back into the thieves’ guild, she needed it to look as real as possible. Malone sauntered to the counter with her hands in her pockets. She withdrew the diamond necklace and laid it over the glass. In the overhead light, the stones glittered and sparkled. She retrieved the emerald necklace from her pocket. Paulson took the necklaces and Malone waited at the counter as he examined each under his jeweler’s scope. He held them at different angles, murmuring admiration for the stones, how exquisite, how expensive. Malone caught her distorted reflection in a tall display case beside the counter. Her baggy thief’s clothes hid her feminine frame just enough, and the makeup made her pale skin appear several shades darker. The nappy light brown wig hid her blonde hair from view. Her looks had been tarnished enough that her old friends in the thieves’ guild wouldn’t recognize her. It made sneaking back in that much easier. Not quite a year ago, she’d been the top thief in the guild. She’d boasted the highest bounty. She might have been the most notorious thief not just in the city, but in all of Eidolon. She’d used her devil’s blood to climb to the top of the ladder. She’d been nearly untouchable, but thanks to one slipup, the PAB had caught her. She’d been working as an agent for the PAB for about five months, give or take a week or two. “I’ll give you twenty gold for the emerald and thirty gold for the diamonds,” said Paulson. He held the necklaces out between them. “Sold,” Malone said quickly, in the desperate tone of a poor thief who’d just made a small fortune, even though she could have gotten twice the gold. Malone knew that; Skip didn’t. Paulson grinned as he slipped the necklaces out of her view. He retrieved a black drawstring leather bag from his side and counted out her gold. He slid them one at a time across to her. Once the gold had been counted, she dumped the fifty gold into her own coin purse. Malone grinned like a proud fool and left Paulson’s store with her gold bouncing against her side, clinking and clanking. She walked three blocks and stepped into a shady tavern owned by a fence, called The Tapped Keg. Few people, minus the dedicated drunks, graced its twenty-four-hour low-lit bar. Malone slumped onto a seat, while adjusting her nonexistent man parts, and ordered a glass of their finest white wine. The bartender, a beefy man with tattoos up and down both arms, poured the wine into a chipped stemmed glass and set it in front of her. She took a sip of the chilled wine and slumped onto the bar. She took a much-needed breath. She’d rather have a cup of black coffee or something a lot stronger than wine. But, Alice Malone drank coffee; Skip Wilson drank white wine. She’d spent the last three months building a reputation for Skip Wilson so that she could get back into the thieves’ guild all in an effort to find information on Seamus Sylvester and his mysterious new partner in crime, Johnny. So far, she had nothing. Malone sipped the wine until the empty glass looked back at her. She proudly paid the bartender in gold, plus a gold for a tip, and walked out of the tavern. The sun had risen in the meantime and warmed the crispness out of the air. She loved this weather, not too cool, not too hot, and perfect for a light sweater. She headed uptown to the Benton Inn, a cheap motel that didn’t require anything but a name and an upfront payment. She kept a room on the third floor to call home for Skip Wilson. She’d rather not have the guild follow Skip back to an apartment owned by the PAB. She changed out of Skip’s clothes and set her wig on the head-shaped metal frame. Just in case, she put the wig underneath the counter. She didn’t hang up the clothes. It looked more authentic if they looked wrinkled and slept-in. She washed off the makeup and grime in the tiny shower. She combed out her blonde hair and twisted it into a bun, which she concealed underneath the hood of a loose sweater. She wore sunglasses to hide her eyes and wrapped a frumpy cardigan around her shoulders. Rather than use the front entrance, she climbed out the kitchen window and onto the fire escape so that no curious eyes would see Skip Wilson enter and Alice Malone exit. She took a cab uptown and stopped at Bertha Rose’s, a hole-in-the-wall café that knew her by name. She ordered two coffees, a blueberry muffin, and a pancake breakfast to-go, and then headed toward the PAB for her daily eight o’clock check in. The main building of the PAB campus was an imposing five-story structure of dark stone and tinted windows. The PAB had been standing before the city’s founding several hundred years ago and it looked more like a fortress than a business. Rumors said the building had been used as a fort during the war that dismantled the monarchy and replaced it with the PAB. Malone climbed the stone front steps and went through the grand front doors that look more likely to lead into a dungeon than into the marble-floored lobby. The day workers didn’t arrive until eight, and two security guards played a game of cards on one of the desks. They returned to their game. Malone entered the stairwell and climbed to the third floor, Public Works. She walked across the mostly empty gray cubicle forest to her boss’s office on the far side. A brass plaque on the door read, Agent Michael Clearwater. She knocked and let herself in. Agent Clearwater sat at his cluttered desk, scowling. Clearwater was an average man in his early forties, but he looked older. He always gave Malone the impression of being overworked. Malone shut the door behind her and slumped into one of the old armchairs in front of his desk. They might have been blue once, but they’d since faded into dismal gray. She set the brown paper bag of breakfast on the floor. They said no greetings or pleasantries. Clearwater swiveled around in his office chair to the bookshelf behind him. He turned a dial on a large antique radio; a word-sputter and garbled static filled the room. “I’m getting closer. They know my name,” she said. She barely spoke over the static; this way no one could listen in. Clearwater had never told her who he thought might be listening, but she’d never asked. Partly because she’d rather not know. “The next step is to be invited into the guild,” Malone said. As far as she knew, it was. She’d never seen it. She’d heard about it. Sylvester had brought her into the guild personally. He’d been the guild master and no one had argued. Clearwater frowned. He’d been against her plan to sneak back into the guild. It had taken a month to convince him. “Fingers?” Clearwater asked, brow raised. After her arrest, Clearwater had given her a deal. She could take the risk of a trial, or join the PAB as an agent. The trial would not have been in her favor; the city knew her name and occupation as a thief. The city knew about her blood type. A trial would have ended in a death sentence. She choose the more reasonable path. She joined the PAB as Agent Malone. The PAB was Belle City’s infrastructure of law and order; agents were devils trained to protect the city from other devils. So far, however, it felt more like a way for the PAB to keep an eye on the devils they’d found.